On January 2, Netflix issued a warning to viewers, asking them to refrain from participating in the ‘challenge’ as it could result in serious injury. The fad is based on the Netflix Original film that captures the challenges of Malorie, played by Sandra Bullock, and her two children, who attempt to navigate through a post-apocalyptic world. Most characters in the film spend the majority of their time blindfolded — a way for them to stay alive and move around, without going insane. Since being released on Netflix on December 21, 2018, the movie has skyrocketed in popularity. Within a week of being released, over 45 million accounts had watched Bird Box – the strongest seven days ever for a Netflix film. Its widespread popularity eventually turned into the Bird Box challenge. In this, people attempt to move from one location to another or perform their everyday tasks while blindfolded. The stuntman’s video was posted to social media on Sunday, titled “How to Survive Bird Box” by Instagram user @parkourporpoise. Not only did @parkourporpoise not get the memo, he’d give Bullock a serious run for her money. 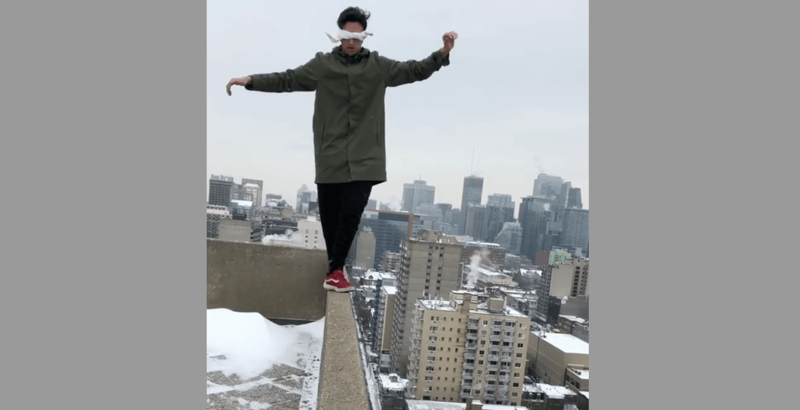 In the video, the man is seen parkouring around Montreal’s malls, fast-food chains and is even seen balancing atop a building with the city’s skyline behind him. We in no way condone this type of behaviour and were pleased to see the stuntman come out his ‘challenge’ uninjured.